Pictured is the First Unitarian Church in Alton. Physician William Greenleaf Eliot, grandfather of poet T.S. Eliot, helped bring the Unitarian faith to the area in the late 1830s. Not every haunted location is widely known but if you're a fan of the paranormal you likely know all about Alton's haunted reputation. Troy Taylor's Haunted Alton details the strange and unusual of this small river town. 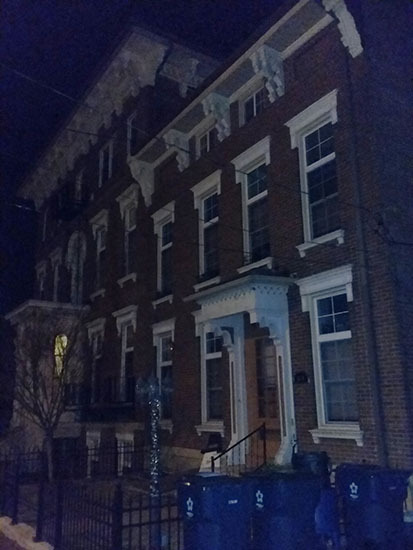 Taylor's company, American Hauntings, offers the public an authentic and professional adventure with their haunted history tours and paranormal investigations. 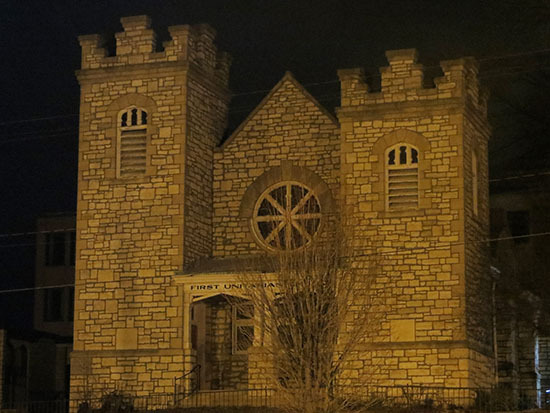 At the top of the hill on 3rd street you will find two of Alton's most haunted locations: the First Unitarian Church and old Enos Sanatorium. Neither location disappoints. Wrapped in history, turmoil, and sadness, both locations are a paranormal investigator's dream. During a tour of the First Unitarian Church guests learn the location was originally home to St. Matthews Catholic Church which had previously burned in a fire. In 1854 the Unitarians purchased the land and used some of the remaining stone from the Catholic Church to build their own structure. Passages in the lower level of the Unitarian Church are thought to have been used as part of the Underground Railroad to hide slaves as they escaped North. Unfortunately the Unitarian Church met a similar fate as the Catholic Church, burning in the early 1900s. The church was rebuilt in 1905 and the Unitarians continued to crusade for social change and equality. In 1928 Phillip Mercer came to Alton and became the reverend of the church. Not much was known about Reverend Mercer as he seemed to keep to himself, although he was friendly and genuinely accepted by the church. Peaceful times at the church didn't last long, as tragedy would strike again but this time it was death. In 1934, Reverend Mercer's body was discovered in the Church and his death was ruled a suicide. Suspicion surrounded his death as no note was found and the scene where the body was discovered created more questions than answers. Reports of hauntings in the church are decades long and include hearing voices and people moving around when the church is empty, seeing shadow figures, being touched by an unseen presence, and unwelcomed negative emotional responses such as crying that occur without any known reason. One of the spirits believed to reside in the church is Reverend Mercer. His spirit has been known to appear in photographs and even communicate through a spirit box. During a recent investigation one group set up EMF meters at the pulpit as well as spirit box. When mentioning Reverend Mercer and moving close to the pulpit, the EMF would increase. When feeling as though the spirit communicating through the EMF meter might be annoyed with their presence, they asked the spirit to tell them to "get out" through the spirit box. Initially the spirit did not appear to repeat the requested phrase but rather said "no" several times. However, upon review of the recording it appeared the spirit may have repeated the phrase "get out" earlier in the conversation, making it known that the spirit was present and also intelligent. Reverend Mercer is not the only spirit to inhabit the old church. A negative entity is believed to show itself from time to time but keeps mainly to a lower level of the church. The heavy and unwelcoming energy of this spirit has been felt by many and some have even left the building in complete terror after an encounter. In addition, the theory of Underground Railroad tunnels in the building has led to the idea that some of the spirits may be escaped slaves. Photographs of spirits that appear to be children have also been taken in the church. No matter whoever or whatever lingers in the church, it appears to have a strong presence and is willing to show itself to those who visit. Down the road from the church, a magnificent mansion stands. This building known as the Enos Sanatorium was built in 1857 by an abolitionist named Nathanial Hanson. During construction of the home, tunnels were created in the basement to serve as a stop on the Underground Railroad. It is said the cupola on the roof was used to communicate and signal escaped slaves on the other side of the river to give them a sign of when it would be safe to cross over to the free state of Illinois. Pictured is the old Enos Sanatorium. This location is a widely known stop on the Underground Railroad and a part of Alton's abolistionist history. During tours and certain paranormal investigations, you are allowed into one of the Underground Railroad tunnels that still exists. Without a doubt, there is still energy in the dark and ominous tunnel. There is no telling how many slaves used the tunnel on their journey to freedom. The sadness, fear, and uncertainty of their arrival into Alton has left an impression on the brick and stone walls. Accounts of the paranormal in this tunnel include several people feeling as though someone was holding their hand only to realize that no living person is there. One young woman even experienced feeling someone place their hands on her shoulders and when she discovered nobody was there she turned and saw a dark figure stand in front of her, obviously sending her into a panic. The intense emotion of the tunnel is only amplified by the building becoming a tuberculous sanatorium in 1911 after being purchased by Dr. W.H. Enos.. Back in those days there was no cure for the disease and the only treatment was fresh air and food. Author, paranormal investigator, and American Haunting's guide Luke Naliborski describes how in the winter the windows would be left open to let in fresh air and sometimes this would lead to snow on the patients' beds. Needless to say the building was filled with sadness and death. After the tuberculous sanatorium closed the building was turned into apartments. Oddly enough, the residents of the apartments never seemed to stay very long. Numerous residents have reported hearing footsteps and loud noises from the floors above them only to realize nobody was up there. Objects turn up missing in the apartment only to appear later, adding to the unexplained occurrences in the building. If you're a history buff, paranormal enthusiast, or both, you will enjoy the trip to Alton and the haunted history tours and investigations offered by American Hauntings. "It's a neat avenue to get a group of people who won't think you are crazy when you tell your stories. Doing events like this not only are more true to the science, but also give new investigators an opportunity to be involved in an investigation and network with others who have been doing it a long time," says Naliborski. You can checkout www.altonhauntings.com for haunted history tour dates that feature the locations above. 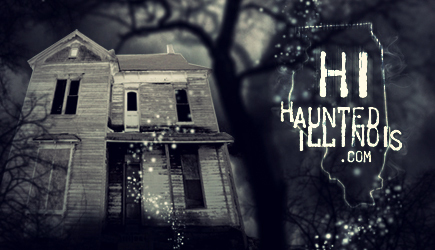 American Hauntings features numerous events throughout the year in and around Alton. In fact, their 21st Annual Haunted America Conference will take place in Alton. The event will feature speakers and experts in the paranormal field, vendor booths, an art show, and after hours events. More information and tickets are available at www.americanspookshows.com. Copies of Haunted Alton as well as other Troy Taylor books can be found at American Hauntings events as well as www.whitechapelpress.com. Luke Naliborksi has written his own books regarding paranormal experiences in Alton and other locations. His books are available in paperback and kindle. You can find more information on Luke by searching Facebook for: Luke Naliborski: Paranormal Investigator, Researcher, and Author or by visiting his store's Facebook: www.facebook.com/IHadThatToy.